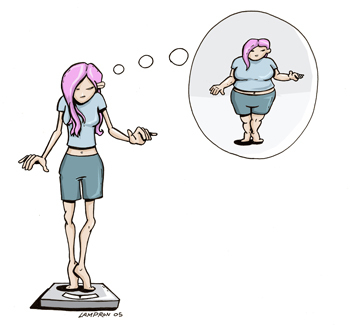 Pop quiz: When you think of a person who has an eating disorder what image comes to mind? If you said a teenage girl, then you’re like most people, including myself. Sure we’ve all heard the stats that teenage boys also suffer from eating disorders, but often it’s young girls who are the face of the disease. More and more, women in their 40s, 50s, 60s and beyond are being diagnosed and treated for eating disorders. And we’re not just talking about women who have relapsed. Many have developed the disorders midlife. When I first found this out it seemed strange because I’ve always thought of older women as people who are very secure in their lives and at peace with the way they look. But it turns out they’re just as insecure as the rest of us. They’re also not immune to the psychological stressors that lead to an eating disorder. Where a young girl turns toward obsessive exercising and control over her diet as a way to deal with her parents’ divorce, an older women turns toward the same behaviors as a way to deal with her own divorce. The reason why not much attention has been paid to this group until now is because the normal symptoms of an eating disorder are easier to conceal in older women. If a teenage girl stops getting her period, it’s a big deal. If a woman in her 50s stops getting hers, it’s chalked up to menopause. Osteoporosis is a warning sign in a young girl, but women tend to lose bone density as they age, so once again a symptom is overlooked as just being a normal part of the aging process. This entry was posted on March 29, 2011 at 10:52 am and is filed under Body Image, Health Crisises. You can follow any responses to this entry through the RSS 2.0 feed. You can leave a response, or trackback from your own site.